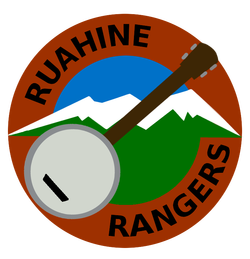 A four-piece acoustic bluegrass band with three members, the Ruahine Rangers are based in Palmerston North, New Zealand, consisting of a banjo player, a guitarist, and a fiddler/mandolinist. Combining great instrumental skills wth slick two- and three-part harmonies, they play a mixture of classic and modern bluegrass, with a leavening of old time, folk, and original music. Their repertoire includes bluegrass favourites like Sitting on Top of the World and Gold Rush, as well as folk music like Wayfaring Stranger and Bayou Noir. From slow, sweet ballads to toe-tapping breakdowns, they’ll make you smile, make you cry, and make you get out of your seat and dance. Available for birthdays, conferences, markets, and other events. Let the Ruahine Rangers inject some rhythm and energy into your event!